Understand where and why flow control valves are used. The different types available and how they work. 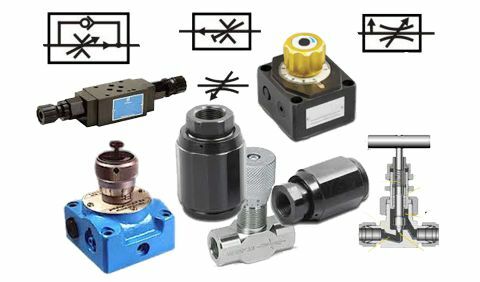 Hydraulic flow control valves are used to control the speed at which actuators move, once directional valves have opened to set the direction. Most hydraulic machines will contain several actuators, all of which will need to move at different speeds. Flow control valves are used to control the speed of movement and allow changes to be made during setup and/or operation. Flow control valves may also be called needle valves, throttle valves, flow regulator, an orifice, restrictor valve or a priority valve. Pressure compensated flow control valves are used to give a constant flow/speed of the equipment when the load pressure changes. In a simple throttle valve the flow is based on the pressure drop across it, so as the load or supply pressure changes, the pressure drop across it and therefore the flow also change. By controlling the speed that fluid flows through pilot lines, onto the end of a spool, for example, flow control valves can be used to control the speed that each valve opens and therefore the acceleration and deceleration of loads. Flow control valves are often combined with other valves to control their operation. Probably the most common of these is in parallel with a simple check valve to produce a valve that only restricts the flow in one direction. Priority flow control valves are used to supply flow into one line as a priority, but only when that flow demand has been satisfied will the remainder of the flow can pass into a second supply line. In their simplest form, a flow control valve is just an orifice. Fluid flow will increase until the p.d. (pressure drop) across the orifice is the same as the supply pressure, less the load pressure. Supply pressure into the system must equal load pressure out of the system plus the pressure drop lost across the orifice. The pressure drop across the valve is used as a brake to control the actuator speed. Adjustable flow control valves contain an adjustable orifice. Higher quality valves have sharp edge orifice designs that provide more consistent flow across the working temperature range. Pressure compensated flow control valves contain a variable orifice whose size changes as the pressure drop across it changes e.g. a spool element moving up and down to adjust the size of the flow orifice port. This means the flow through the valves stays constant under most operating conditions and the orifice size varies instead. A fixed or adjustable orifice with a by-pass check to control the flow in one direction only. A pressure compensated flow control valve with or without by-pass check. Hydraulic engineers often use the term, meter-in or meter-out flow control. In both cases, the valves are likely to be the same and it's just the way they are used that is different. With meter-in flow control we throttle the flow before the actuator. With meter-out flow control we throttle the flow after the actuator e.g. the check valve is installed the other way around. See also the flow control valves in our symbols sections. In mobile equipment, smooth control of actuator speed is generally very important so it is common to use proportional control valves rather than more simple, flow control valves. Cost is also very important so a simple orifice or crude adjustable orifice may be used when proportional control is not required. A common format for flow control in industrial applications is the double flow control and bypass check slice that sits below a CETOP valve. When flow control speed are more critical higher quality valves exist with more accurate pressure and temperature compensation. Learn more about flow control valves in our 'Professional Training Section'. Understand their design features, performance limits, and how to specify flow valves.